Best Fit Muscle Model Trunks are great for athletes that compete in Male Muscle Model Competition. These trunks will let you express your unique style and look on stage. Most Muscle Model trunks are just swimwear that fits but not built to show off your look exactly as you want. 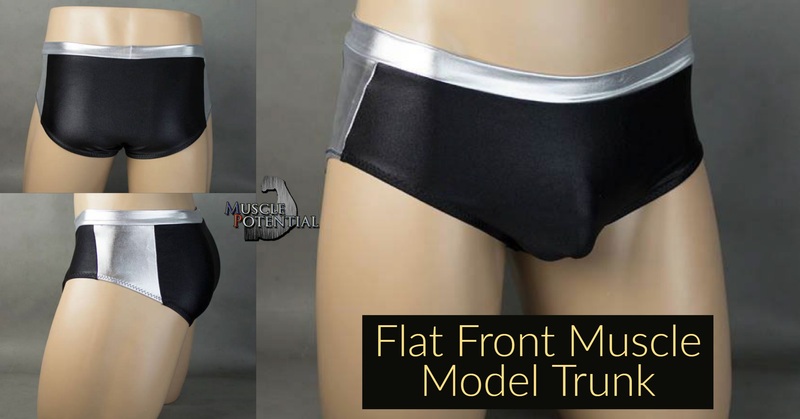 Flat Front Muscle Model Trunk– These flat front style gives you 3 color options. Choose your main, a side panel and a waistband color. Contoured Front Muscle Model Trunk– These are pouched front trunk with 3 color options. Choose pouch, a side panel and a waistband color. Don’t get a muscle model trunks that doesn’t fit you like you deserve, TAKE CONTROL OF YOUR LOOK ON STAGE with Muscle Potential BEST FIT Muscle Model Trunks.